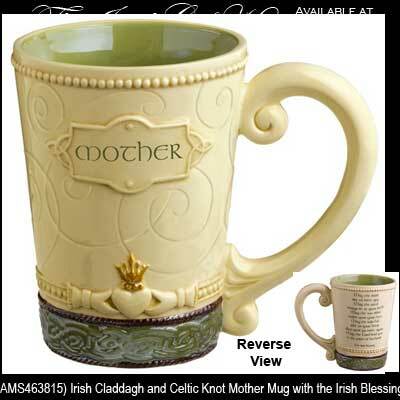 This Irish coffee mug for mother features a blessing along with the Claddagh and Celtic knot-work. Mom will love this Irish coffee mug that is designed just for her. The Irish coffee cup features Mother along with the Claddagh and a Celtic motif on the front, and the Irish blessing on the reverse. The Irish Mother's coffee cup measures 4 3/4" wide x 5" tall and it holds 13 ounces of your favorite beverage. The mug is made of dishwasher and microwave oven safe ceramic and it is gift boxed with Claddagh and Celtic knot history cards that are complements of The Irish Gift House.